I love Alan Dart's toys. I have a very precious stack of pages from old English Women's Weeklies from the days when he was resident designer for this magazine. Many of these are for licensed characters that are no longer available; Beatrix Potter, The Wombles, Thomas the Tank Engine, the Flintstones and the Mr Men characters. I've made lots of Alan's toys over the years. This is the tale of Mr Clever. I initially made Mr Clever as a present for friend who shared my journey back into mature aged return to University study. We bonded over a student focus group redesigning a compulsory Discrete Mathematics course for IT majors. 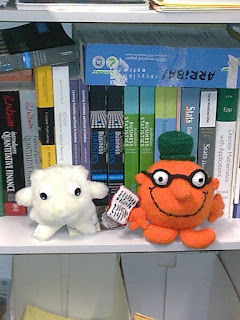 (One of my first jobs for the Uni was actually teaching the new improved version of the unit). We discovered a shared love of sewing. My kids got along OK with her kids. My husband and I enjoyed dinner parties at her place and helped her husband introduced us to the delights of a wine cellar where cost was no option. Grange anyone? She always told me she wasn't really clever. So I made Mr Clever to tell her I thought she was. Then her life imploded in a messy divorce and we lost contact. 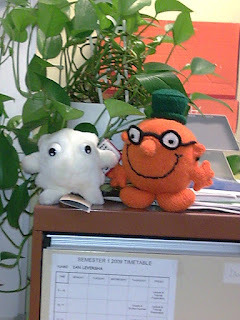 So Mr Clever never made it to his intended recipient and hangs around in my office at work. Often he can be seen in my desk trays. Sometimes he hangs out with the pot plant on the top of the filing cabinet. He communes with the stats books on the shelf. He does lots of chilling with his mate, the giant plush white blood cell. Here he is hanging at home over the Christmas holidays after coming home to have a wash to de-cobweb. 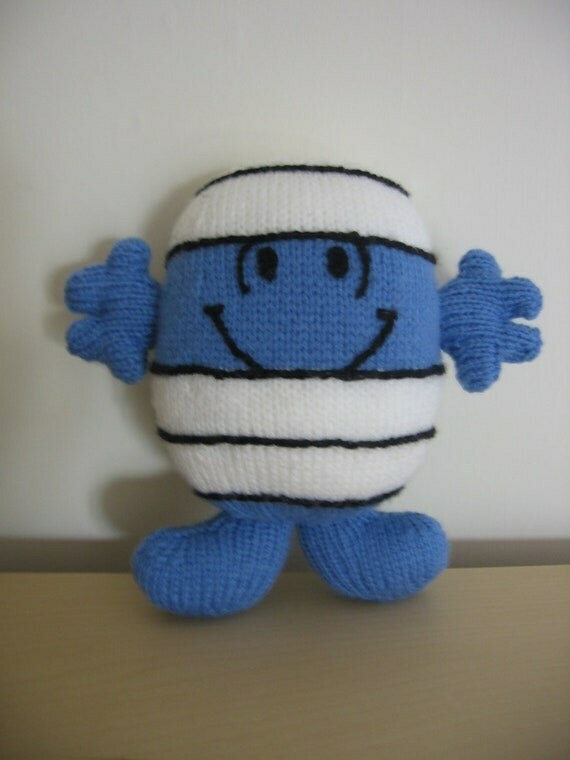 I'd really love to get my hands on the pattern for Mr Bump who is the Mr Men character who holds a sentimental place in our family. It is in the full Mr Men pattern book but not in the patterns published in the English Women's Weekly. With a family of martial artists, minor bumps, bruises and petty injuries are an everyday occurrence. We have a joke Best Bruise of the Week award. I think a handmade Mr Bump would encapsulate the spirit of this award beautifully. And Mr Bump is the boy's favourite. Where did you get the white blood cell? I adore Mr Clever. I want that book too. I loved reading the books to my kids and I am now passing the books onto my grandkids.